Pictured above is one of street artist CityzenKane's latest 3D street installation. 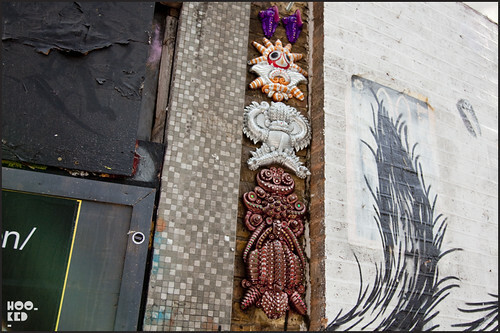 The last few years has seen the artist instal his elaborate 3D sculptural works arcoss the streets of East London. This recent work sandwiched between the old Foundry building and the Red Gallery near Old Street, has been affixed to the building just slightly outta reach, ensuring the longevity of this piece. Sculpted in a polymer clay these pieces are then used to make a mould with silicon rubber which allows the artist to create replicas based on the original polymer clay version. Using the moulds and plaster of paris, the artist begins the next process of these labour intensive street. 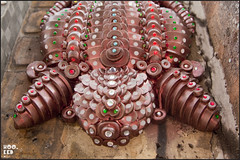 Once the plaster in the moulds has set and dried the artist then sets about decorates each piece using a comination of metalic paints, glitter and Swarovski crystals to complete each piece. 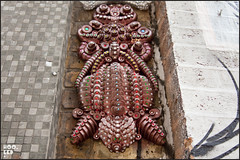 These sculptures can often take a number of months to complete, the large Lord Jagannath piece which some of you may have seen located on Brick Lane took the artist three months to make before installing it in the street!! Have a look at the video posted below featuring Cityzenkane working on a large scale piece and you will get an idea of the sheer volume of work that goes into all his work.